This black Phoenix 150W RGBA LED Profile 50° Spot Light from Altman is a fixed focus luminaire. It is designed and engineered with a number of innovative details and features, enhancing versatility and efficiency without sacrificing performance. Fully locking shutters, and a 360° barrel help keep your fixture's focus intact and easy to attain. This model features a RGBA LED array with a 50° lens for a variety of different colored lighting effects with the red, green, blue, and amber LEDs. Also, the 150W is convection cooled for quiet operation. With virtually no light leak from the fixture itself you won't have to worry about any extra light illuminating unwanted parts of the ceiling. The aesthetic appearance and ergonomically designed function controls only add to the appeal. 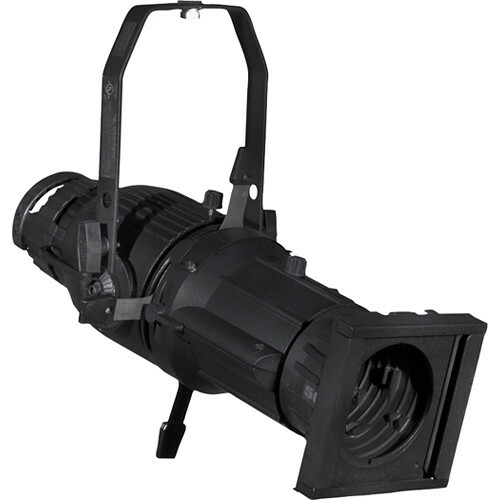 All of these options are what makes the Phoenix ideal for theaters, special events, television studios, or wherever energy efficient lighting performance is required.